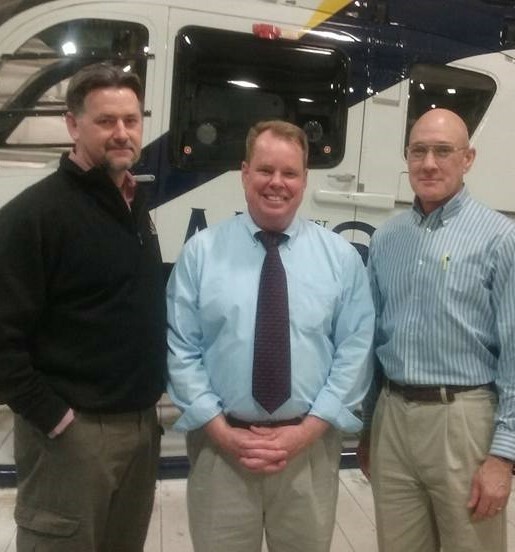 "Then captains courageous, whom death could not daunt..."
AMRM Training Solutions was chosen for a presentation on Air Medical Resource Management at Northwest MedStar's (NWM) recent safety-day symposium in Spokane, Washington. The first plan was for a two-hour AMRM session, then as the situation developed, this was reduced to one hour. I wondered at the change of plans, but - if the customer wants it, and is paying for it - I will make it work, and work well. The NWM team-leader is himself a retired Navy diver, and medic, and these two men have a shared bond of service. It is only natural that such an example of leadership and dedication as a career SEAL commander would be invited to speak to a high-speed organization - like Northwest MedStar. As it turned out they got not one SEAL, but two! I arrived in Spokane the day prior to the symposium, and was treated to a fine evening of good food and camaraderie at Spokane's exclusive Davenport Hotel. I got to share experiences and memories of military service with the other speakers, and also members of the NWM leadership team - many of whom have a military background. It is always a pleasure to rub shoulders with American military professionals. And good for the soul. They too make waves. Indeed, the Naval Special Warfare team is comprised of thousands of folks, some of whom fly (and parachute, and swim, and patrol), and some of whom support operations from a quiet dark room with monitors and computers. Some fly, some shoot, some support. All are special. Yes, it made perfect sense to invite two SEALs to speak to a team of incredibly motivated, highly trained, dedicated and determined healthcare professionals. And it was an inspiring hour, listening to Captains Dave and Rob talk about becoming a SEAL, and what happens after. One bit that went straight to heart was Dave's discussion of "earning your Trident every day." Their overall message was: "Good leadership and good teamwork equal good safety." Dave and Rob are retired from military service now, like me, and every day they wake up determined to earn the Trident that they were awarded all those years ago. Rob and Dave are ambassadors for the United States Navy, and for the SEALs, They know people are looking at them all the time, forming opinions of the organizations they represent from what they as individuals do. 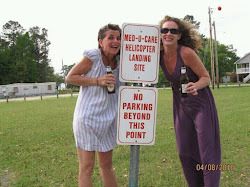 It's like that with us, we who operate, work in, and support EMS helicopters. We are HEMS. Every day. On duty and off. 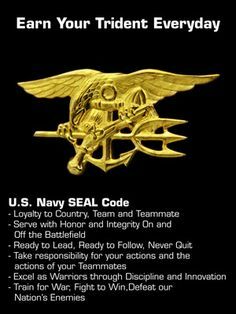 Our seal of honor is the set of wings we wear on our chest. These two gentlemen created a safety-symposium experience for Northwest MedStar that made a real impact on this retired soldier-pilot and AMRM instructor. They will visit your flight program and do the same for you! After 30 years of flying; instructing helicopter pilots, and being instructed by them, I can't remember where I first heard this line, "Fly the disk." I have been thinking about it lately though, considering how appropriate it is for all of us to remember that we must fly, better yet, we must "be" the rotor disk. Of course you know the "disk" is the spinning rotor system above our heads. When you are flying, it is life. The speed at which it turns is important. The attitude at which is travels through the air is important too. Years ago, a check airman recounted a story about flying a Bolkow BO-105 cross-country with oilfield workers on board. A large long-legged fellow was sitting behind the pilot, with big heavy boots on. They were a few hundred feet up when the passenger shifted his feet forward and dropped his boot on top of the collective. It went down to the stop. The aircraft tucked nose-down. 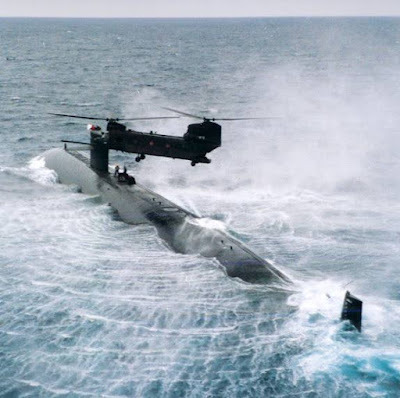 The rotor system went from the normal thrusting state into an abnormal state, in which on-rushing air was passing through the entire disk from top to bottom - not through the action of the moving rotor blades, but in spite of them. This pilot initially had absolutely no control of his rotor disk, and the situation was grim. The trees were right there in front of the windscreen. They were all yelling. Len told me that he pushed and pulled on the collective and moved the cyclic through all the quadrants trying to get the rotor disk tilted correctly, with the leading edge up. At the last second, just before impact, he did it. Air went back up through the rotor from bottom to top - autorotative state. And then he increased collective - normal thrusting state - and climbed away. During my last annual training I was flying with a sharp, charismatic young check-airman named Micah. I had told him that I was worried about my autorotation skills and needed practice, and he was having me perform autorotations to a runway. I did a couple of decent maneuvers, got over-confident, then botched one up. I lowered the collective, entered autorotation, then looked at my airspeed. It was fast. I looked at my rotor RPM, it was too high. Then I got nervous and wanted to slow everything down to figure out what was wrong and how to fix it. I began to pull backward on the cyclic. Micah (like all good instructors) was ahead of me, and had his hand behind the cyclic to prevent this. He said, "don't pull back, you will overspeed the rotor system." If I pulled back on the cyclic, I would tilt the disk toward the rear, nose up, and the onrushing air would increase the already high rotor RPM. I was distracted by indications, I wasn't flying the disk. Note to self: Think about the rotor disk first. Everything else is secondary. This reminds me of my very first time teaching autorotations as a very low-time flight instructor in the R22. My student (who was exceptionally talented, and remains a great friend) was already a rated airplane pilot, and I had been gravely warned about airplane pilots' tendencies to instinctively push the cyclic forward following an engine failure. So, fearing for our lives, I had sternly warned him, DO NOT PUSH THE CYCLIC FORWARD. https://www.youtube.com/watch?v=YOl2YEH6wFU an NTSB investigator is shown presenting two autorotation scenarios (with video). In one, after loss of power the pilot lowers the collective and applies aft cyclic. This changes the rotor disk from the normal thrusting state to the autorotative state. They land safely. Next the video shows loss of power, reduction of collective, but no application of aft cyclic. As described above, the aircraft tucks nose down - it crashes in a few seconds. Do you remember the Air France jet that crashed into the South Atlantic a few years ago? The investigation revealed that the pilots either never had, or had lost basic piloting skills. Basic stick and rudder "air sense." They were so accustomed to being "systems operators" - a requisite skill in such a technologically advanced aircraft as the AIRBUS jet they were operating - that they were unable to cope with the loss of airspeed sensors and autoflight systems. Our helicopters too are becoming marvels of modern technology. Autopilots are now so light and inexpensive that they are coming to the light-singles that many of us fly. Engine governors, fuel controls, and FADECS have removed the need for us to manage power with a collective twist-grip. The act of flying is easier than ever before. We are becoming less like pilots and more like systems operators. Autopilots will further divorce us from the need, and the skills, to manipulate the flight controls. An anecdote : PHI Airmedical's chief pilot and I were talking about a Bell 230 that we both had experience with. He had delivered it to his pilots on a hospital contract, and at first none of them were comfortable with operating the autopilot. He recounted that they were reluctant to trust it, and preferred the hands-on approach. He left and came back to the base six months later. They had worn the paint off of the autopilot buttons. Helicopter meets Superbowl. Here's to a great game! Guthrie One - 25 years later - A Situational Awareness Case Study. What would you do differently tonight? The docket is stored on NTSB microfiche number 43142. THE MEDIVAC HELICOPTER WAS RETURNING TO SAYRE AFTER TRANSPORTING A PATIENT TO DANVILLE. 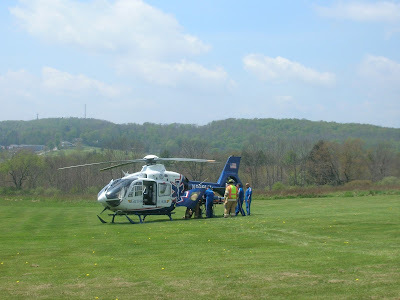 RECORDED RADAR DATA AND DATA OBTAINED FROM THE HELICOPTER'S LORAN-C MEMORY INDICATES THAT THE FLIGHT WAS FOLLOWING A DIRECT COURSE FROM THE GEISINGER MEDICAL CENTER AT DANVILLE TO THE ROBERT PACKER HOSPITAL AT SAYRE. THE ACFT'S HSI WAS SET TO DISPLAY LORAN COURSE INFORMATION. 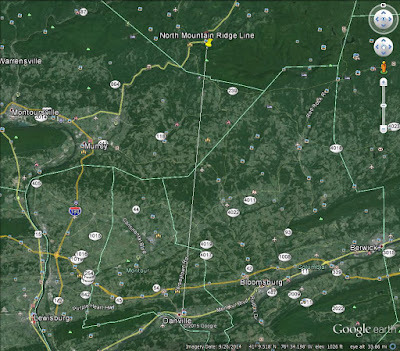 THE CLOSEST POINT OF THE COURSE TO THE CREST OF NORTH MOUNTAIN WAS APRX 3/4 MILE TO THE WEST. 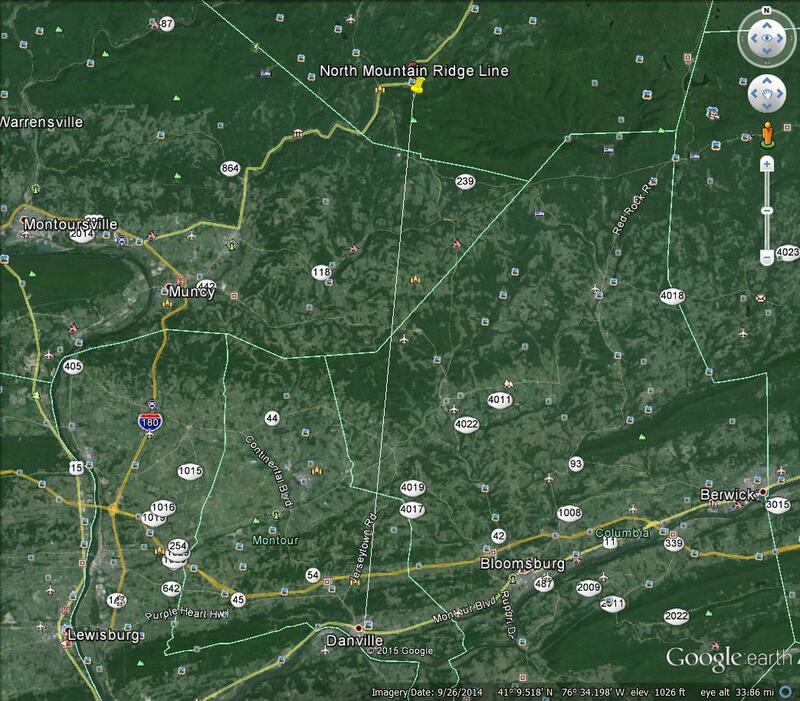 THE PILOT HAD ADVISED WILLIAMSPORT ATCT TRANSITTING THEIR CONTROL ZONE AT 2,500 FT. IMPACT OCCURRED AT 2,440 FT MSL. THE CREST OF THE RIDGE IS 2,520 FT MSL WITH 40-FT HIGH TREES. A WITNESS WHO LIVES IN A CABIN ON THE MOUNTAIN 200 YARDS FROM THE ACCIDENT SITE STATED THAT IT WAS SNOWING VERY HARD WHEN HE ARRIVED AT THE CABIN AROUND 1930. Guthie Air conducts a mock patient drill. Jack would tell us that this is life and life is worth living; live it to the fullest," said former Guthrie pilot, Stan Rose, in remembering his friend. "I still feel bad, but I want to thank you, Jack, for a great example of how to live a life. Jack Goodwin was employed by Keystone Helicopter Services and had been with Guthrie One since the program began in 1989. 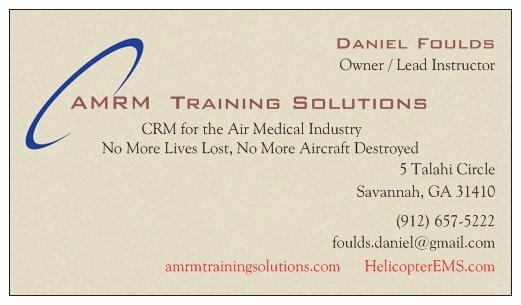 A 10-year veteran of helicopter flying, Jack had been an EMS pilot since 1987. At the time of his death, he was a member of the Pennsylvania Air National Guard Unit in Phillipsburg, PA. He served in the U.S. Army Military Police at Fort Gordon, Georgia and also flew in Korea. He attended Penn State University and graduated from the U.S. Aviation Program at Fort Rucker, Alabama in 1981. 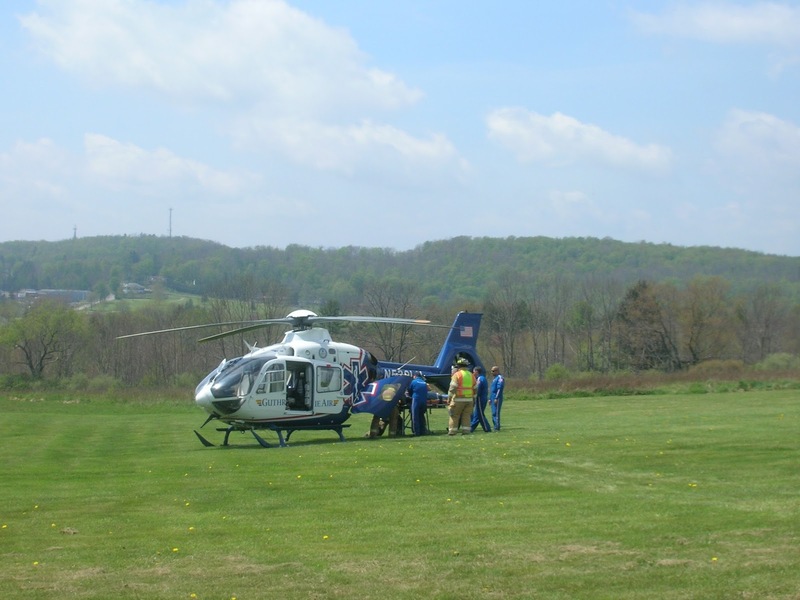 On a return flight from Robert Packer Hospital in Sayre, PA to Geisinger Medical Center, in Danville, PA, the helicopter Jack was flying crashed on North Mountain during a snow storm. All those aboard lost their lives including 35-year-old Jack Goodwin. The unfortunate accident happened on January 26, 1991. "She always faced challenges and met them head on," said flight nurse, Jack Strollo of his colleague. "Deb was not afraid to die because she was not afraid to live. If everyone was a little bit less afraid to live, then the footprints that Deb has so deeply planted in our hearts will never fade away." Deb Nole, 32, graduated from the Geisinger Medical Center School of Nursing and worked in the intensive care unit of Moses Taylor Hospital in Scranton before coming to Robert Packer Hospital. She began her career at Guthrie in 1986 as a nurse in the intensive care unit at Robert Packer Hospital. As soon as she heard of the plans for Guthrie One Helicopter and its flight program, she couldn't wait to climb on board. 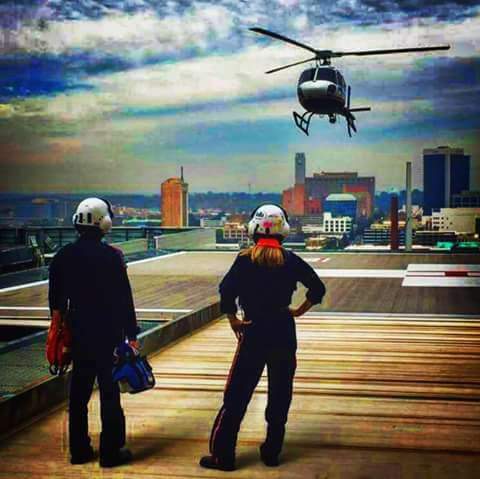 Deborah J. Nole, a critical care flight nurse, lost her life when the helicopter she was riding crashed on return from transporting a patient from Robert Packer Hospital to Geisinger Medical Center in Pennsylvania. Deb was one of three crew members who lost their life aboard Flight #609. An estimated crowd of 2,000 filled the sanctuary for the memorial service for the crew. EMS personnel arrived in emergency vehicles from many of the areas the helicopter had visited during its first year and a half. Tributes were sent from as far away as California. "What I admired most was the way Mark dedicated his life to helping people and the professional way in which he did it. I'll miss his guidance and his assistance," said a co-worker, Tom Brandt, a flight nurse, of how Mr. Haussler influenced his career. When Mr. Brandt entered the flight service he said he had a "very clinical approach" to the work. His association with Mr. Haussler helped him to develop a "new pattern in emergency medical nursing," he said. Mark Haussler, 26, was a Guthrie One flight paramedic. He joined the Guthrie family in 1987 as an EMS training coordinator. Mark graduated from Davenport College Center for the Study of Emergency Medical Services in Michigan with a degree in paramedic/EMS management. Long committed to EMS, Mark's career included serving as a volunteer firefighter with Athens Borough. He also served as regional training coordinator for the Bradford/Susquehanna Emergency Health Service Region and was a staff paramedic and supervisor with Bay State Ambulance Service of New England. "He was a kind and gentle man and a super uncle," said nephew Walt Rogers as he remembered Ed Soper. "From the first time he saw Guthrie One, Ed had a dream to fly with the flight team. Other than his family, his life revolved around being good enough to get aboard that bird." A dedicated EMS volunteer, Mr. Soper was a member of the H.O.P.S. Ambulance Service, served 10 years with the LeRaysville Fire Department and was an emergency communications dispatcher for Bradford and Sullivan counties. He lived on and operated a dairy farm in LeRaysville at the time of his death. Mr. Soper was a flight observer aboard Guthrie One helicopter #609, on a patient transport from Robert Packer Hospital to Geisinger Medical Center, in Pennsylvania when it crashed, ending the lives of all aboard. An estimated crowd of 2,000 filled the sanctuary as family, colleagues and friends remembered the crew. 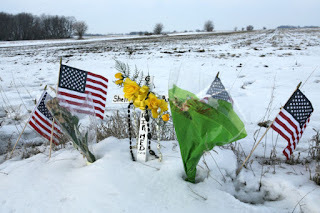 Tributes and memorial donations were sent from other flight teams throughout the northeast, and as far away as California.